The Ultimate Investment – Yourself! How would you like to invest in yourself? How would you like to learn EVERYTHING about starting and succeeding in your own business? How would you like to skip the tenuous and length college MBA and focus instead on a 2 DAY intensive designed to teach you everything you NEED to know about entrepreneurship? I will be attending this Dreaming Room, with E-Myth founder and author Michael E. Gerber and I’m inviting only 15 Dreamers to join me in this most amazing experience! And best of all Michael is offering this unique and rare event on the East Coast (something he rarely does) and for only a fraction of its original price! This opportunity cannot be missed! So What’s a Dreaming Room? The Dreaming Room is a 2-day “Entrepreneurial Incubator” with Michael E. Gerber himself, jam packed with the knowledge necessary for anyone who wishes to build the business they’ve always dreamed of or wish to dream of. You will truly experience everything you’ve ever read about E-Myth and Entrepreneurship, and you will come to understand, in vivid, extreme and creative detail how to start the business you’ve always dreamed of. You’ll get to know the 4 components of the Entrepreneur: 1) The Dreamer, who has a dream 2) The Thinker, who has a vision 3) The Storyteller, who has a purpose and 4) The Leader, who has a mission. What Will You Learn In The Dreaming Room? whether they ask it or not! I’ll wager you’re wrestling with that decision right now. If you were buying a computer seminar, that question would be relevant. If you were buying a cell phone seminar, that question could be answered, and should be. If you were buying a sales training seminar, of course you would want to know that the course will provide you with the information you need to become more effective at sales. All such events, what we’ll call training events, are designed to teach you operating skills. Operating skills are work skills. Work skills are those you use inside of your business to produce work results. And therein lies the difference between The Dreaming Room and all training events. Training Events are Right-Brained Events. The Dreaming Room is a Left- Brained Event. Right-Brained events teach you Work Skills. Left-Brained events teach you Life Skills. Right-Brained events teach you how to DO something. Left-Brained events teach you how to SEE something. DOING is a Right-Brained activity. SEEING is a Left-Brained activity. SEEING is what happens in The Dreaming Room. It is an activity of your intuition. It is Soul activity, not Brain activity. It is about heightening your state of attention. Of presence. Of imagination. Of congruence. SEEING is what Entrepreneurs do. It is a completely different kind of DOING. It is not about the DOING that technicians do. It’s about the DOING that inventors do. It happens inside of you, not outside of you. Inside of you is where all the life-sourcing occurs. It’s where all the magic lives. It’s where all the energy resides. It’s where the ideas come from. The great ideas. The powerful ideas. The ideas that make life happen outside you. The ideas that give birth to great companies. Toward that end, The Dreaming Room is designed to awaken the entrepreneur within you. Not to make you more effective at working IN your business, but to make you more effective at working ON your business. The entrepreneur is the one who creates the opportunities that are waiting for you in the world around you. To fill them with your vitality. With your spirit. With your passion. With your imagination. With your Soul. But in order to create opportunities, the entrepreneur within you must first recognize what an opportunity is, and what purpose it serves. That’s what happens in The Dreaming Room. What happens in the Dreaming Room is that each and every participant is taken on a unique, one-of-a-kind journey. Unique, because it is their journey and their journey only. The journey one goes on in the Dreaming Room is therefore completely unpredictable because no two participants are the same. No two journeys are the same. In the Dreaming Room you are not the same as the fellow or women seated to your right or to your left. Your creative surge is yours alone. Your path to freedom is only yours, and no one else’s. Your personality, your history, your obstacles toward inventing a new life through the creation of a new venture, are only applicable, and therefore important, to you. To you alone. That’s why we say that The Dreaming Room process is no more or less than an original experience. A deeply personal, evolutionary experience that is impossible to describe. Since only you can know it when it happens. And only you can do it when you are so awakened. A blank piece of paper and beginner’s mind. That’s all you need to know when you come to The Dreaming Room. Along with the desire to explore your own imagination. Are you up to experiencing a miracle inside? Well, that’s what I do in The Dreaming Room. Don’t ask me how I do it. Ask anyone who’s been there. They’ll tell you the very same thing. That’s why I love to do it. That’s why I know I will love doing it with you. 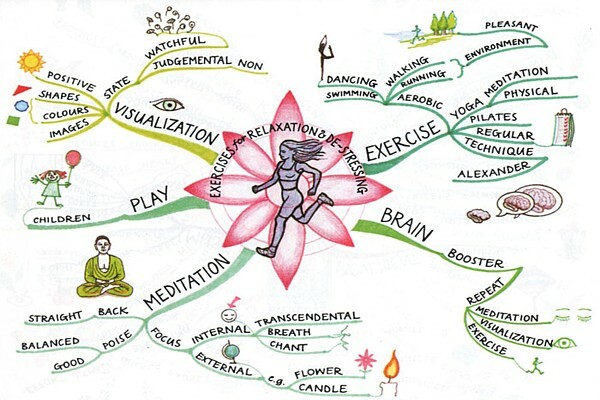 I recently came across a concept called “Mind Mapping”. Start in the center of your mental world. Create a central image that represents the topic about which you are writing or thinking. a) Use at least three colors. b) Keep the height and width of the central image to approx. 2’’ or 5 cm (proportionately larger for bigger paper). c) Allow the image to create its own shape (do not use a frame). 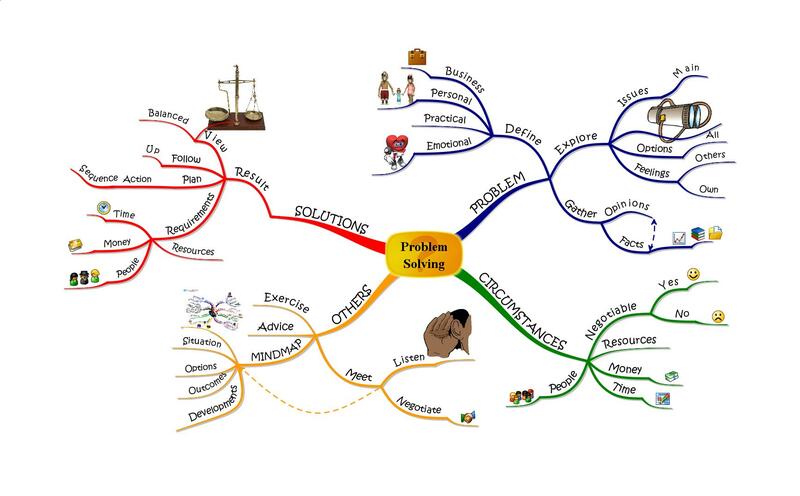 Draw the main branches of the Mind map from the central image; these are your main ideas, like the chapter headings in a book. a) Print this word in CAPITALS or draw an image. b) Place on a line of the same length. c) The central lines are thick, curved, and organic—like your arm joining your body or the branch of a tree to the trunk. Start to add a second level of thought. These words or images are linked to the main branch that triggered them. a) Lines connect are thinner. b) Words are still printed but may be lower case. Add a third or fourth level of data as thoughts come to you. a) Use images as much as you can, instead of, or in addition to the words. b) Allow your thoughts to come freely, meaning you ‘jump about’ the Mind Map as the links and associations occur to you. 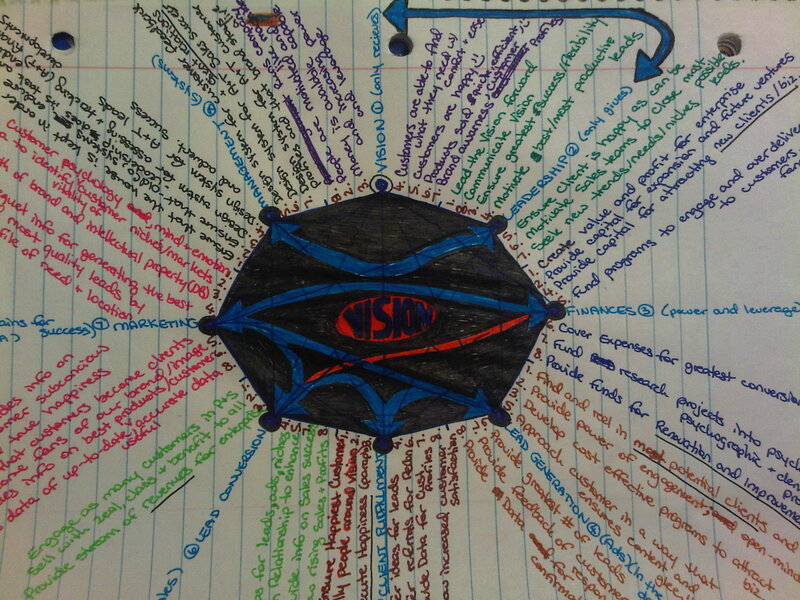 Outline branches of a Mind Map with color, if desired. a) Enclose the shape of the branch. Hug the shape tightly. b) Use different colors and styles. 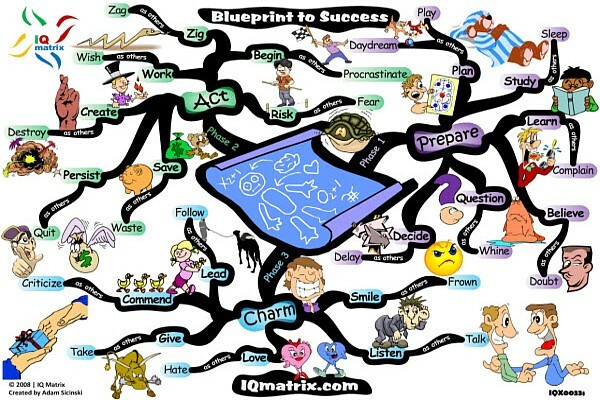 Make each Mind Map a little more: beautiful, artistic, colorful, imaginative, dimensional. Some examples are perfect, though this one isn’t. It’s an impromptu mind map (designed as an Organization Chart) based on the “7 Disciplines of the Entrepreneur”, as explained by E-Myth founder, Michael E. Gerber. As you could see its very detailed, as well as very colorful. So get out a blank sheet of paper, some colored pens/markers and try it yourself! It’s amazing how involved you’ll get once you begin! Here are the 5 books Every Entrepreneur Must Read before launching any business or organization. Furthermore, while audio books are quite useful and easier to listen to, I suggest you go out and buy the actual books since so much information, graphs and visualizations are contained in them. Kawasaki essentially outlines the progressive stages of launching your business with a practical and simple rather than deep and complex approach. Learn what VCs want to hear and how to setup a sound business from the ground up! While Gerber’s previous book the E-Myth Revisited details why you must build a systematized business, this version explains how. This is the entrepreneur’s bible; an invaluable asset to any business, start-up or Fortune 500. Learn why systems, not people, run your business best! I have many people tell me its unrealistic. I disagree. This is your “Get Out of Jail Free/Rat Race” card before you even get in. Ferriss, though far from conventional lays out how you have to improve everything from your life to your business and back again. Learn how to Delegate, Eliminate, Automate and Liberate! What makes great companies great? Collins moves away the clutter to identify the most essential qualities every revolutionary enterprise possesses. Learn why your Values and Vision are worth so many times your balance sheets. So what makes people wealthy? Kiyosaki walks through the fundamentals of wealth creation and good business sense to provide the aspiring entrepreneur the keys to untold riches. Learn why the words “Cash Flow” are the most important words you’ll ever hear. These books aren’t just worth a few great lines, they will change your entire perspective on your business and the way you approach your life while achieving your goals. The only additional keys you need are passion, creativity, common sense and perseverance!